A miracle is the manifestation in this world of the laws of another world. A higher world is exempt from the laws that govern the worlds beneath it, and this exemption, seen from the vantage point of the lower, comes across as miraculous. If, like Jesus, I walk on water, then I defy the laws of gravity. If, like Muhammad, I bring rain during a drought, then I defy the laws of meteorology. If, like the Buddha, I take seven steps after being born from my mother’s side, then I defy the laws of physiology. And if, like Mary, I conceive while remaining a virgin, then I defy the laws of pregnancy. The evolution of man’s consciousness hinges around the very same principle. “In an ordinary psychic state I simply look at a street,” says George Gurdjieff. “But if I remember myself, I do not simply look at the street; I feel that I am looking, as though saying to myself: ‘I am looking.’ Instead of one impression of the street there are two impressions, one of the street and another of myself looking…” The view of the street is like God to Mary or sunlight to the plant. It bathes everything indiscriminately. From the sidewalk, a fly, finch, french bulldog, or human being are all afforded with the same view. But the human alone can internalize this impression to elicit a process that culminates in self-consciousness. Self-remembering is photosynthesis in the micro-cosmos man. 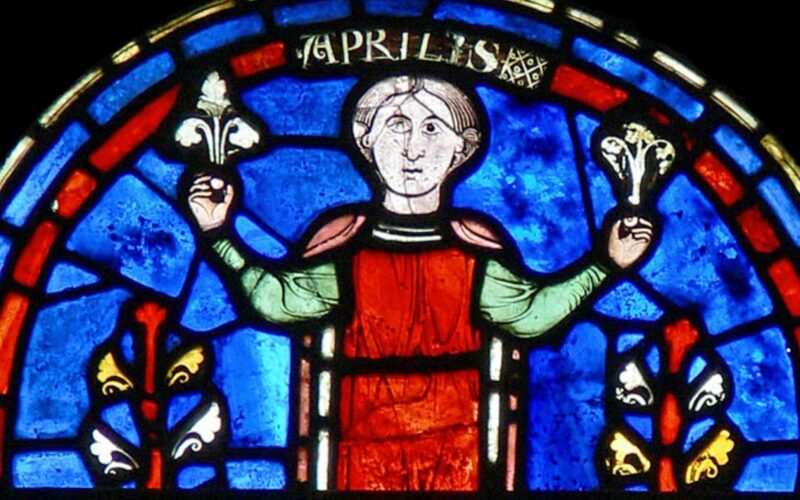 Is it a remarkable coincidence that the feast of the Annunciation would be celebrated around the Spring Equinox, heralding the reappearance of foliage in nature? Or did the Gospel authors have in mind the miracle of photosynthesis when they coined the miracle of their virgin? April is planting time. Our Chartres farmer displays two plants that he himself has germinated. Now that temperatures will rise, he must transfer his plants to their final position in the garden. But before this is done, a selection must be made: plants that are too weak or too small cannot properly enact the miracle of photosynthesis. They will develop improperly and produce a poor harvest. Our farmer must therefore choose the good and discard the bad. This is his Labor of April. We must apply similar discrimination. We are in search of the miraculous — not in Egypt, Ceylon, or India, but standing on the street where we live. The present is reliably there. It is up to us to Be there for it, to use it as a catalyst for self-consciousness. Our skills in photosynthesis have improved. Having formulated aims around our habits during January, experimented with non-identification during February, pruned and refined our work during March, we are naturally brought to the position of asking ourselves: which of our efforts really work? Focus on those and discard the rest.